Flu season is creeping up on us college students and we are doing everything in our power to keep it away. 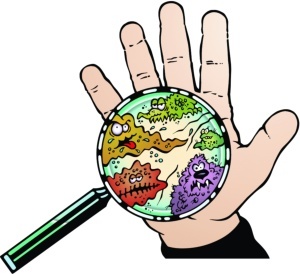 Vitamin C, disinfectant, and Clorox wipes are our best friends right now, but we also must keep our hands clean to reduce spreading germs. Growing up I’m sure we all were told to wash our hands with “hot” or “warm” water to kill the germs with the heat, but how many of those germs can this water actually kill? As I searched for a topic for one of my blog posts I thought educating you, soon to be germy people, beforehand to prevent the spread of sickness that no one wants. A research assistant from the Vanderbilt Institute for Energy and Environment in Tennessee, Amanda R. Carrico, has researched if warm or hot water really does aid in the killing of bacteria we carry on our skin. Personally, I have always known heat kills bacteria from when I got my ears pierced with a needle that had to be burned with a flame before use, or when I had a splinter in my foot as a child and my grandpa had to heat a safety pin to kill the germs before jabbing it into my heel. But what Carrico explains is the precise temperature and degree the flame or water must be to eliminate bacteria. She explains, and I quote, ” boiling water 215°F, is sometimes used to kill germs- for example to disinfect drinking water that might be contaminated with pathogens. But “hot” water for hand washing is generally within 104°F to 131°F. At the end of that range, heat could kill some pathogens but the sustained contact that would be required would scald the skin” (nationalgeographic.com) . After analyzing the data it makes more sense, if you can barely feel the hot water on your skin or barely feel the cold water on your skin, it cant be doing much. Pain would have to be present for there to be a noticeable change, therefore Carrico’s findings would disprove this “wash your hands with warm water to kill germs” saying that the entire world has been following for years. She even found that using cold water and warm water is basically the same thing. After washing, scrubbing, and drying, there are about the same amount of germs killed with both processes which many of you may not have even realized (nationalgeographic.com). Some people are even irritated by warm water which could actually cause irritation to the skin which is the protective layer that prevents bacteria and germs from accumulating. This finding completely refutes again, the belief of washing your hands with hot water kills germs. I have also found that washing your hands with hot water effects more than just your own skin or the germs on your skin, it effects the environment we live in. Because of this false belief we have been following for years, Carrico and her team have found that people wash their hands with warm or hot water 64 percent of the time they wash their hands at all (nationalgeographic.com). This statistic shows just how severe carbon emissions being released into the environment annually are, and the impact on the planet where we live, due to the hot water being used. Therefore, this is me asking you to stop believing what your grandmother, mother, father, or sister has been telling you for all these years and wake up; hot water from the sink is not killing enough germs to keep the bacteria off. If we as a whole begin to wash our hands with cool water instead of hot, we can reduce the carbon emissions drastically and benefit our world as a whole. This entry was posted in Uncategorized on September 16, 2016 by lem5522. This article blew my mind. When I was a little girl, it was engrained in my mind to always wash my hands with warm water because cold water wouldn’t kill the germs. I can definitely understand why washing hands with hot water actually does more harm than cold water. Extremely hot water on the skin irritates, burns, and could make hands itchy. Scratching your hands could make them raw and open the pores, making it easier for germs to penetrate. Although the study concluded that cold water may be more beneficial in terms of skin irritation, I’m going to continue washing my hands with warm water. Cold water tends to dry skin out and it would definitely be the last thing I’d want to run on my hands during the freezing winter months (typically the time people get sick). Wow this article is great for this time of year. In every large class that I am in, there are at least 10-12 kids coughing repeatedly. I am one of those kids. Since coming to school, I have been sick 3 times and its terrible. I always catch every thing going around (including whooping cough last year) and I don’t know why. I take daily vitamins, wash my hands religiously, and clean my belongings and surroundings in my room almost daily. I always knew boiling things get rid of germs and bacteria , however, I never thought of this in regards to hand washing. It makes a lot of sense what you discussed here in your past and I will definitely keep this is mind when I feel bad about myself and my failed attempts at trying to keep away from sickness. I found your blog post to be very interesting, especially since ever class I am in there is at least five people coughing. It is actually kind of hilarious to watch and listen to all the coughing going on in the room. Many times you can see the professor crack a laugh because it is just crazy how fast everyone gets sick. I mean it’s only the fourth week into classes and majority of the students are sick. I am one of those students who is already sick and I wash my hands like crazy trying to avoid everyone’s germs. As a child I was always told was your hands with hot water. So that is what I have been doing all my life. Apparently I need to was my hands with colder water. I think I will try this out and see if it really works, it’ll be so interesting to me if it does!